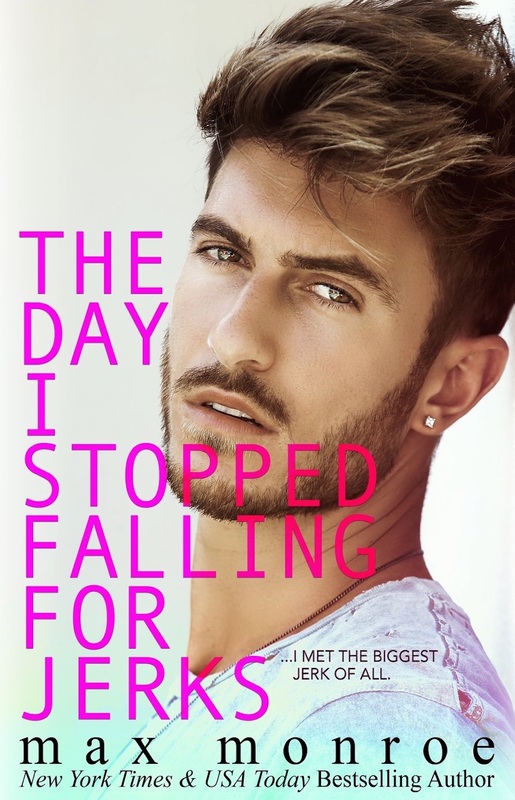 The first book in the all-new Jerk duet from author Max Monroe is available now, and I have a little sneak peek for you, as well as a chance to win a signed paperback copy. As you can tell, I’m truly gifted at giving personal pep talks. The journey to baggage claim was long, but with the amount of attention I was paying to my surroundings—i.e., not much—it went quickly. Allie had sent me an email while I was somewhere over the Atlantic…or the Indian Ocean…or the Pacific. Hell, I’m not even sure. But I was over water, and there was a lot of it. My brother knows your flight details, and he will personally be there to pick you up from the airport and bring you to the hotel. You’re staying at the W, and that’s the hotel where the gala will be held, she’d penned like a Girl Scout mom, looking out for her troop. Clearly going through a bout of premature nesting, she’d gone so far as to leave me a list of numbers. Ollie. The hotel. Even the Australian version of the Poison Control Center with a little note of in case you get bitten by a spider or something. Followed by, Just kidding! You’ll be fine! And more than that, you’re going to have the time of your life! I’d worry about living it up as soon as I located her mysterious brother using the vague description she’d provided: Tall, thirty-seven, and brownish hair. Yeah. Real easy to spot that guy, right? Frankly, a little too easy. Take me to any location on any day, and I could find you twenty of her supposed brother, and the Sydney airport was no exception. Hopefully, I thought, Oliver Arsen would be wearing a shirt declaring him as such, working with a better description of me than I had of him, or carrying a very strong resemblance to my best friend. As it turned out, he didn’t have any of the above. Instead, he did me one better. After a quick workout grabbing my three extremely heavy Louis Vuitton suitcases off the baggage carousel—they were full of nearly my entire wardrobe, after all—I scanned the area for a familiar face. In my mind’s eye, I was searching for a much hairier version of Allie. But my mind’s eye might as well have been blind for all the success it had. Officially alone and waiting, I corralled my luggage—awkwardly, mind you—toward the doors and managed to snag a cart to wheel those heavy fuckers around the massive airport while I searched for my ride. Under the weight of the load, the balls of my feet started to ache, and regret for my inability to pack light grew rampant. So what if I didn’t know what I’d feel like three Tuesdays from now? So what if I’m bloated or gain weight or go on the raging blood war period from hell? I should have left the bulk of my baggage to the emotional load I couldn’t help but carry. Nevertheless, I was set in my ways. Hell, I still am. When it comes time to make the journey to France in September to continue the tour, I guarantee I’ll be sporting the same load. With no other option, I wheeled my cart into the center of it all and searched the massive arrivals area for a spark of recognition. Fifteen or so tourists sporting matching red shirts grouped up together near belt number four. A husband and wife grabbed their suitcases and two small children and headed for the pickup area outside. Two young women hurried out of the doors to stop just outside and light up a cigarette. And on the opposite side of the room, a crowd of people, made up mostly of giddy women, had gathered around someone. I wasn’t sure who, but their excitement was more than apparent. My brain started spinning with celebrity thoughts. Didn’t Margot Robbie live in Australia? Wasn’t Nicole Kidman an Aussie? Most importantly, what if it was Chris Hemsworth? I mean, who wouldn’t want to grab a selfie with Thor? This girl certainly would. Which, if you’re for some reason listening to this podcast, Chris Hemsworth…I still would. Also, I love you. Anyway, with visions of Thor’s hammer dancing behind my eyes, I pushed my cart toward the crowd. By the time I reached them, even more people had shown up for pictures, and I could just barely sneak a glimpse of the person demanding all the hoopla and attention. I wasn’t shocked by the fact that it was a certified man candy kind of man, and you shouldn’t be either. Slobby Schmoes rarely pull that kind of attention. Brown, sandy-colored hair that looked like he’d barely run his fingers through it when he’d gotten out of bed that morning and still managed to make it look good. Yep…gorgeous. Slap you right in the face, need a double, then triple take, kind of good-looking, undeniably handsome man. I couldn’t look away, and neither could the crowd. I watched as he signed autographs and took selfies, and with each fan interaction, it was more than obvious a lack of confidence was the least of his problems. He was cocky and enigmatic, and dare I say, slightly untouchable. Before Tiago—before I’d sworn off jerks for good—he was exactly the kind of man I would’ve been drawn to.